But I couldn’t stop. Something drove me to try batch after batch until one day, I realized I had never tried David Lebovitz’s recipe. So I did. And then I made it again later that week, tripling the recipe and freezing the extra. And then I made it again two weeks later- tripling the recipe, and freezing more extra. I was addicted, and now I have logs of cookie dough in my freezer so I can easily bake these up anytime I want (these, and Dorie’s World Peace Cookies). If the sweet coffee toffee cookie was the chocolate chip cookie of my 20’s, this would be the more mature, nut-filled cookie of my 30’s. Yes, nuts, guys. Is it just me, or do only older folks like me enjoy their chocolate chip cookies with nuts? Because recently I served this cookie to a twenty-something, her face twisted into a confused look when I said it had nuts. Like, why would you do that to a chocolate chip cookie? But I’m doing it. And you should, too. It’s so yummy. In David’s original recipe, he instructs us to chill, then slice and bake. 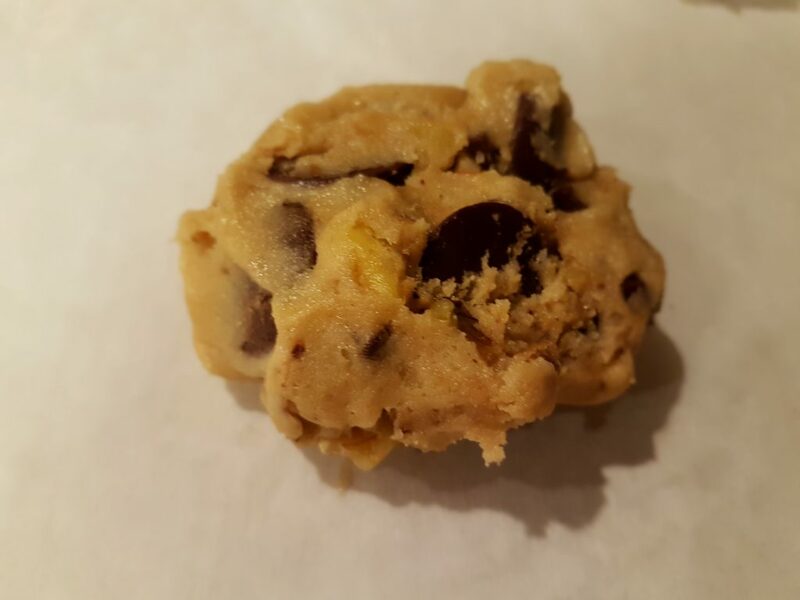 I follow his recipe right up to the end, and then where he slices and bakes, I instead pull apart and squish into big chunky rounds to get the nooks and crannies that I LOVE in chocolate chip cookies. You pick whichever method you like. Your tummy will be happy either way! P.S. 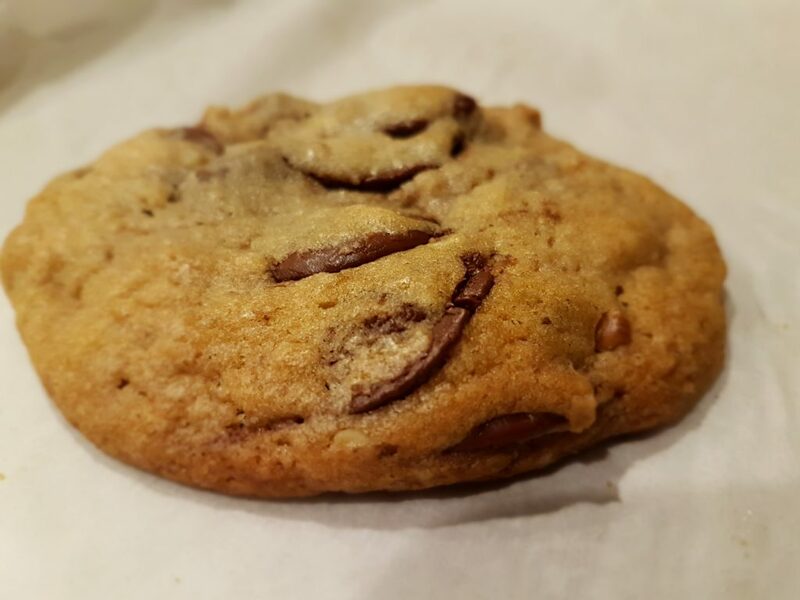 Although I am very content with this recipe right now, I feel like I should mention that David appears to have moved on to a new fav chocolate chip cookie recipe that has tahini (sesame seed paste). I haven’t caught up yet- maybe that’ll be the cookie of my forties. In a stand mixer fitted with the paddle attachment, beat together the butter, brown sugar, granulated sugar, and vanilla on medium speed just until smooth. Beat in the eggs one at a time until thoroughly incorporated, then stir in the flour mixture followed by the nuts and chocolate chunks. On a lightly floured work surface, divide the dough into quarters. Shape each quarter into a log about 9 inches long. Wrap the logs in plastic wrap and refrigerate until form, preferably for 24 hours. Position racks in the upper and lower thirds of the oven; preheat the oven to 350°F. Line 2 baking sheets with parchment paper. Tear each log into 6-8 chunks, depending on how big you like your cookies to be. Squish them into rounds, spacing them 3 inches apart. They don’t have to be perfect on the top. If the nuts or chips crumble out, simply push them back in. Bake, rotating the baking sheets midway through baking, until the cookies are very lightly browned in the centers, about 10-13 minutes. If you like soft chocolate chip cookies, err on the side of underbaking. I’m in suspense over here… what did you think?!?! I just bought some Tahini- will letcha know how it turns out if I happen to try it before you do :). You are too darn cute! Just so you know I personally have found you never really stop looking. Aw :D. I believe it, Janis! 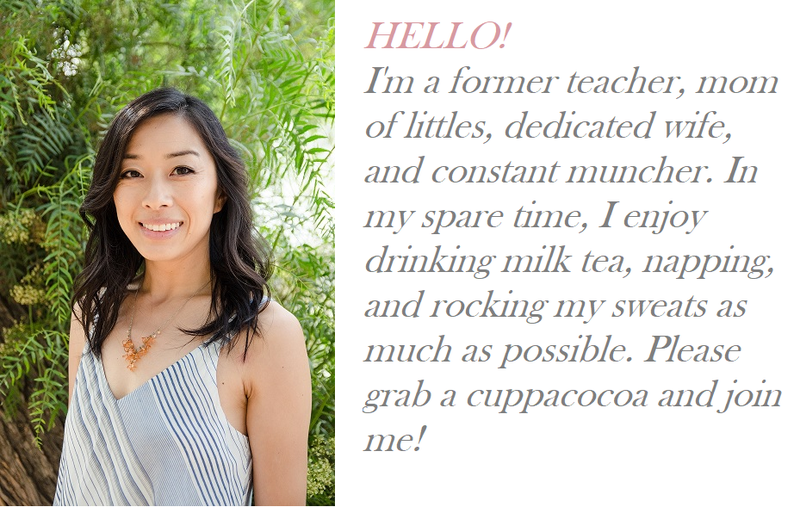 Did you know I’ve daydreamed about owning my own little cafe, too? 🙂 I’m not actually willing to get up super early to run one, but it’s something I’ve thought about a number of times :).